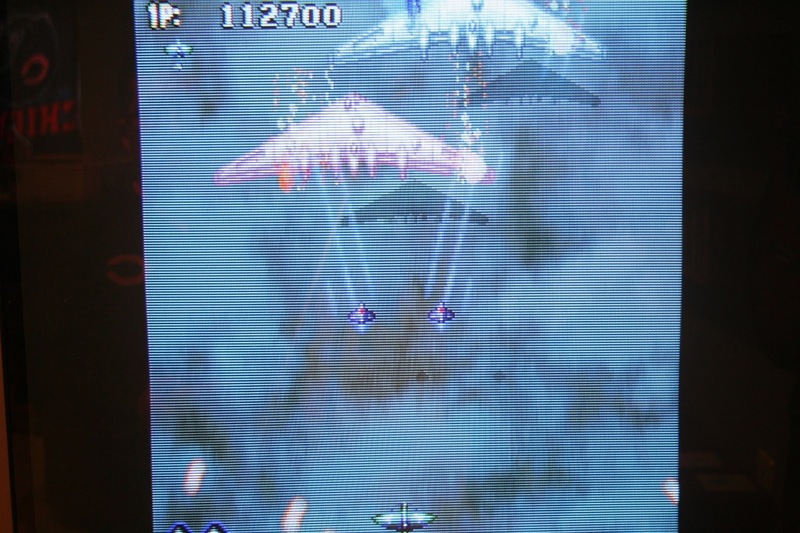 In my earlier posts, I had mentioned that shoot'em ups for the Saturn was my favorite genre. 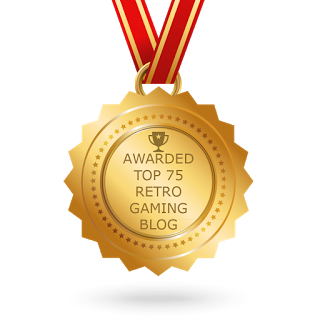 Those posts had mentioned the big name games for the system, and many of them are well known. 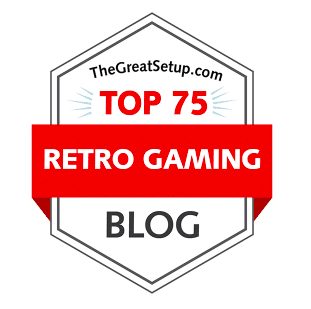 With retro prices forever on the rise, and the global online market for games shrinking the world, I thought I would review one of my favorites that represents the genre and Saturn well, but won't break the bank. 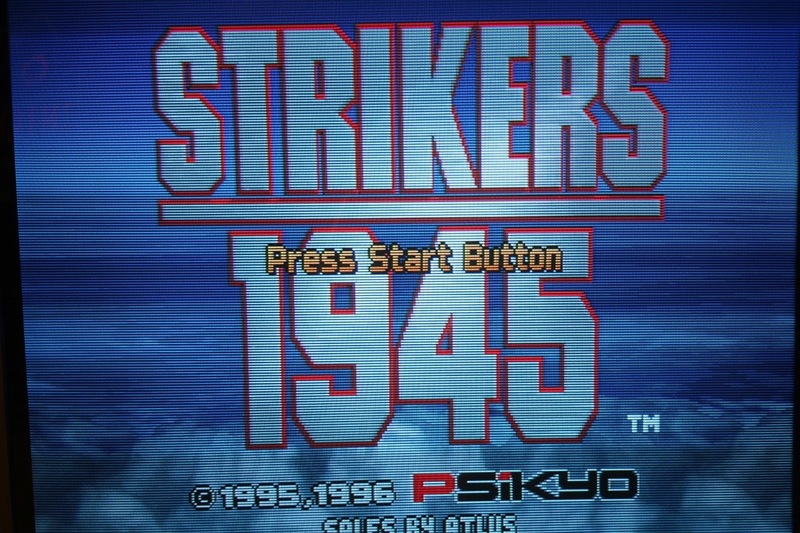 This is Strikers 1945. 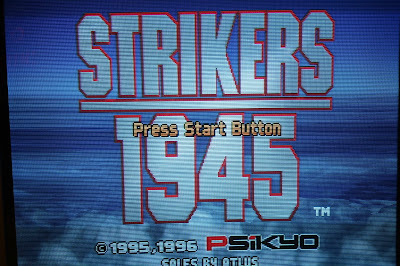 Strikers 1945 was originally released for arcades in 1995, and ported to the Saturn and Playstation in 1996. The game was developed by Psikyo, and published by Atlus. If the developer sounds familiar, that's because they were responsible for Gunbird, Sengoku Blade, and one of my favorites: Zero Gunner 2. Being a huge fan of shooters, but not very good at them, I personally like the option to adjust the difficulty. They let you know that you are disappointing them with the easier settings, as the two easiest settings are referred to as "child" and "monkey". 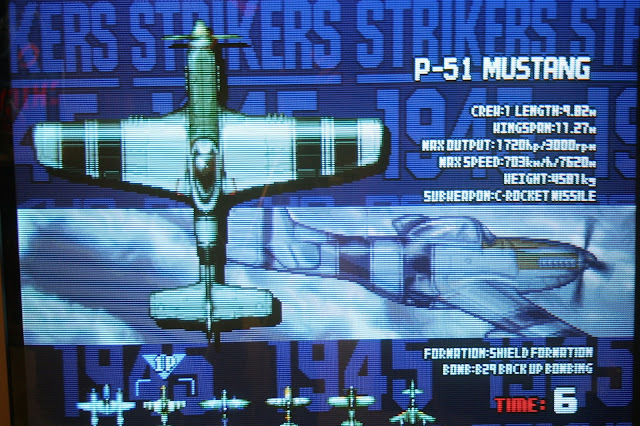 The plane selection screen offers some statistical information as well as the subweapon type. 1 - Basic fire - in most cases, this is a straight-forward vulcan canon (the R button is set to rapid fire). It can be powered up to three times by collecting the bullet icons released by red enemies. Some shot patterns are angles, and some are straight-on. 2 - charge attack - If you hold the shot button, you can align your options (if you're powered up) and unleash a specialized attack unique to each fighter. This is incredibly useful as its usage is unlimited, but there is a drawback - you cannot fire during the charging period, leaving you vulnerable for a few seconds. Strategic use is necessary against bosses if you want to progress farther into the game. Of course the more options you have, the more powerful the attack. This attack is not really that useful if you have only one option. Regular use of your options with a charge shot adds to the gameplay. 3 - bomb attack - You have a limited stock of bombs, so having a strategy for when to use bombs is necessary. In addition to unleashing a deluge of firepower, the bomb attack clears the screen of enemy bullets, getting you out of a tight spot. Some plane's may have a slight delay before their bomb attack gets going, so be wary of the timing. The Spitfire's bomb attack is a seriously awesome beam of destruction. P-38 - This plane is part of the reason why this series is often mistaken as a part of Capcom's 1942/3 series. The options fire a traditional vulcan machine gun as well. The charge attack aligns your options to fire in steadfast formation. The bomb is a loop de loop, just like in 1943, but accompanied with a huge bombshell blast. P-51 Mustang - This plane has a slightly smaller profile, making it easier to dodge enemy fire. The options fire large shots at a slower rate. The charge attack unleashes you options in a rotating cyclone attack, that spins forward inflicting major damage and also erasing enemy fire. Spitfire - Another smaller plane, this is a good choice for beginners. The options fire missiles that are powerful, but are slow. The charge attack aligns your options in a formation that fires at a wider angle, and move as you do instead of flying straight ahead. The bomb attack is ridiculous... just ridiculous. A couple of these will make short work of the bosses. Messerschmidt Bf-109 - The only German plane represented in the game, it is a very offensively-minded plane. The options track enemies on their own, acting completely independently. 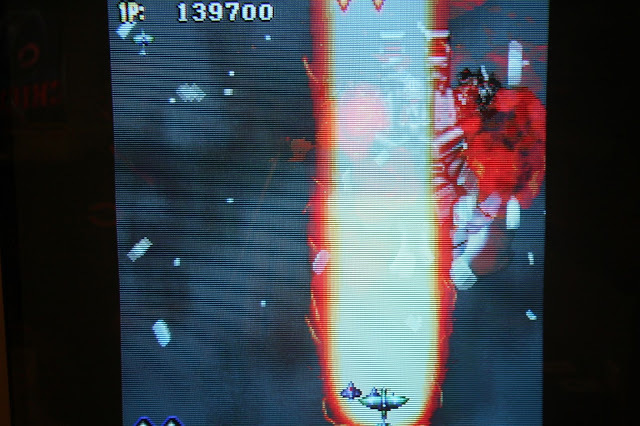 The charge attack sends the options in a rotating cylcone as well, but this time they fire as they move forward. The bomb attack is a carpet bomb air raid. Zero - The first of two Japanese planes, this plane is the most unique in the game. The options drop bombs at surface targets. The charge shot sends the options after enemy targets. 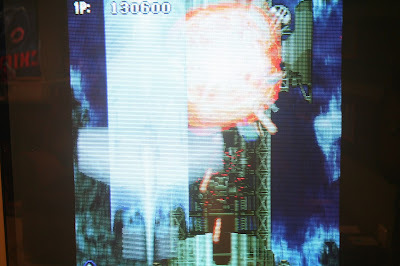 The bomb attack is a tsunami-like storm that inflicts heavy damage on bosses and clears the screen of smaller enemies. 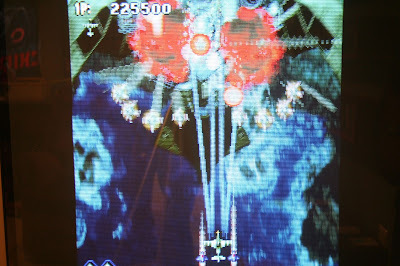 Shinden - Veterans of Saturn shooters may recognize this as the first plane in Battle Garegga, a Saturn exclusive. This plane has a narrow, single file stream of firing. The options fire a standard vulcan alongside your plane. The charge shot is interesting as the options fire horizontlly (and vertically, if you have three or more) in a line that moves up the screen. The bomb attack is the most unique in the game; your craft loops out of the way as it leaves a ghostly silhouette, which darts forward, wrecking everything in its path. The ghost bomb is really creative and satisfying to unleash. There are 8 stages per loop, and are not very long. The first couple of stages seem random each time, where as the later stages are set. I like this idea, as the replay value enhanced. The bosses are generally huge mechanized ships that transform into a giant robot after taking much damage. They have their patterns, and once you figure them out they aren't too difficult. This is a fun, pick up and play shooter. It is even more fun with a friend playing co-op. 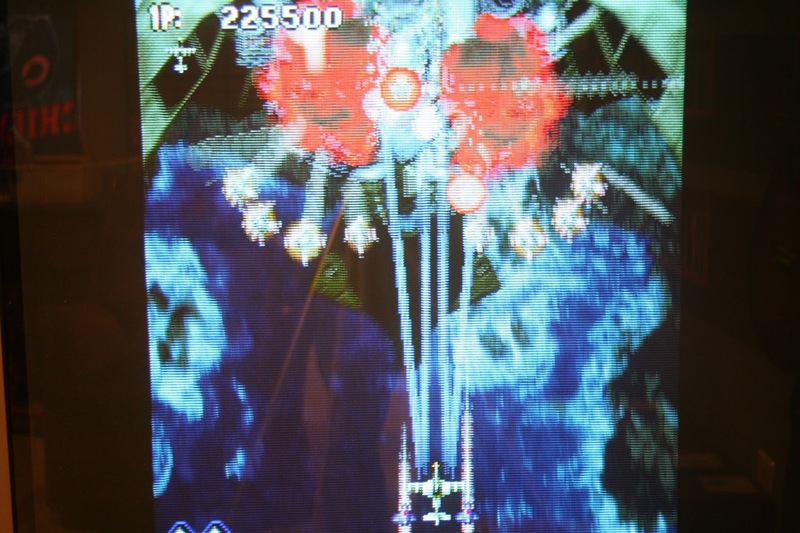 It is not the most ground breaking, or visually impressive game out there for the Saturn, but it is just plain fun. It is still relatively inexpensive but remember that it is a Japanese import, so you will need an Action Replay card or some other region bypass. As I mentioned earlier, there was a Playstation release as well, but whenever a game is released for both platforms, I'll always pick the Saturn version for its awesome controllers (plus, the Playstation's d-pad is horribly rigid). I hope that somebody reads this and give this game a chance. Great write up. This was one of the first shooters I discovered when I got into import gaming. I don't have this on the Saturn surprisingly enough, but I do have Sonic Wings Special which I always felt was a closely related game. I agree with you on the PlayStation controls, however I find the prices of the PS versions to be cheaper across the board. Thanks! I believe the Sonic Wings series was the predecessor to the Strikers series! Hence the similarities.